Special opportunity for a private photo shoot and signed model releases from a local Samburu tribe! Welcome to Kenya, our home! We were privileged to call Kenya our home while Kathy (a tenured university professor) invested her sabbatical to teach students at a leading university outside of Nairobi. It was thrilling to live in a small town, six miles down a dirt road… without a car. Our first morning there was unforgettable. We were enjoying a deep and satisfying sleep after a long day of international travel when suddenly we were startled awake by a loud racket on the metal roof of our flat. I pushed aside the mosquito net, slid out of bed, and pulled back the window curtain to investigate. A line of 20 or more vervet monkeys were running across the roof, jumping to the mango tree, and back to the roof… acting like circus performers. We watched them until they bored of entertaining us and they ran off down the dirt road to the neighboring house. That was the first hour of our first full day in Kenya… and it only got better. Every day brought rich, new experiences, and you’ll encounter something new every day you’re in Kenya, too! This is a country we’ve come to love. We not only lived there, but we’ve visited many, many times and have dear friends there who are like family. We want to introduce you to the Kenya that we called home. Join us on the adventure of a lifetime among elephants and lions, zebras and giraffes… while completely immersing yourself in the joy, creativity and excitement of photography. Kenya is the perfect place to become a better photographer! On this expedition, beginners are welcome… and so are experts! Safari is a Swahili word that simply means “trip” or “journey”… and, as you embark on this amazing safari, your photographic skills will be growing and developing along the way. As you undertake this creative journey, you’ll become more comfortable with your camera than you’ve ever been before. You’ll learn how to get the results that you see in your mind but somehow haven’t been able to capture on your screen. And, at every moment of this expedition, you’ll be with professional photographers who love to share what they know about their craft with you. Plus, you’ll meet others on the same journey… some probably more advanced than you and a few who may be a bit behind you… but we’re all on safari together, as mutually-supportive and encouraging friends. This is a safe place to learn and we’ll have so much fun together! This safari is planned for your maximum enjoyment! There is so much to see in Kenya, so many “bucket list” locations and activities, that it would be completely unfeasible to build them all into one trip… so we’ve worked hard to pick the best of the best for you. We’ve arranged it so we will be flying between locations. This means you won’t have to endure hours of driving on hot, dusty, washboard roads like almost all other safaris put you through. Instead of spending hours bouncing down the worn-out roads, you’ll already be in the game reserves! We’ll spend almost all of our time in two of the premier safari locations on the planet… one of them you’ll instantly recognize as synonymous with world-class wildlife excellence: Masai Mara… and the other you may never have heard of before… it’s off the beaten path and a hidden gem: Samburu. Masai Mara — world-class safari excellence! Kenya is the home of the safari, with good reason: a breathtaking array of East Africa’s wildlife exists here, and the Masai Mara is home to much of it. It’s one of the best-known reserves in the whole of Africa and is globally renowned for its exceptional wildlife and conservation practices. The Masai Mara is the crown jewel of Kenya’s safari areas, and it has been one of Africa’s top wildlife destinations for decades for one reason: nowhere on the entire continent is wildlife more abundant. If photographing the “Big Five” is on your bucket list, this is where you want to be… and, on this expedition, we’ll take you to the prime region to see, and acquire spellbinding photographs of these extraordinary animals. The Masai Mara National Reserve is well known for its abundance of big cats—lions, leopards, and cheetahs are regularly spotted on game drives. 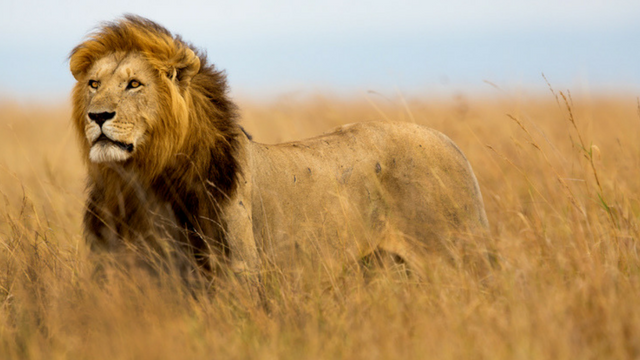 In fact, the Masai Mara ecosystem is estimated to hold one of the highest lion densities in the entire world. This is also the land of the Masai people—an ancient and proud pastoralist culture known for their warriors who were once expected to kill a lion to prove their strength and manhood… now they protect the lion herds. Recognizable by their red robes and beaded jewelry, the Masai follow their cattle herds, moving their settlements as they search for water sources and new pastureland. You’ll meet these amazing people and warm to their welcoming smiles. The Masai Mara—this huge expanse of gently rolling grassland, specked with flat-topped acacia trees and home to massive migrating herds of zebras and wildebeest—may be the ultimate African cliché. But for once, the reality lives up to the iconic image, and the Masai Mara is for many travelers not just the highlight of their Kenyan adventure, but the very reason they came in the first place. Three-hundred-fifty miles north of the Masai Mara, past the rugged, snow-capped peak of Mt. Kenya, as the lush cool greens of the highlands trail off into an arid, brown, semi-desert landscape, you’ll find the Samburu National Reserve, named after the Samburu people—nomadic pastoralists whose traditional finery is among the most beautiful and delicate in the world. It lies on the north side of the Ewaso N’giro River—the dry, brown earth broken up by a lacy, green fringe of tamarind, doum palms, and acacia trees growing along the river’s bank. Elephant, buffalo, lion, and leopard all come to drink here… while large crocodiles bask nearby in the hot sun. In a harsh world on the edge of the desert, where drought is a way of life more years than not, this almost-permanent flowing river is a lifeline for wildlife, including many species simply not found in the southern parks of Kenya, Tanzania or countries further south in the African continent—where most other tourists congregate. While the “big five” (lion, buffalo, leopard, rhinoceros, and elephant) are the sought-after bucket list animals on most African safaris (and you are very, very likely to see them on this expedition! ), there is another list of must-see wildlife, that’s unique to this area of Samburu. They’re called the “Samburu special five” and they’re found here and very few other locations. The large, thin-striped and highly endangered Grévy’s zebra, the stately and uniquely marked reticulated giraffe, the beautiful, tawny, long-horned beisa oryx, the unforgettable long-necked gerenuk antelope, and the blue-necked Somali ostrich, whose kick can kill a lion! They’re all so amazing to photograph. Besides the “Samburu special five,” the dominant mammal here is the elephant. Plus, this region is renowned for cats—all three species of big cat hunt in the reserves, with a good number of leopard always present in the wooded riverbank areas, elegant cheetahs to photograph on the prowl, and several lion prides often using forest cover for their ambushes. Imagine experiencing all this beauty of nature alongside like-minded people who share your love for great photographic moments, lively conversation over drinks, gourmet meals, adventure, and fun! Some of the friendships forged on a trip like this can last forever! So don’t hesitate to come by yourself—you’ll meet friends you wish lived near you so that you could see them every week! I remember as we were nearing the end of the time we’d been living in Kenya that I told Kathy one day I had a special treat for her—I’d reserved a tented camp for us to spend our last weekend in the Nairobi National Park. We had already driven through the reserve several times and marveled at the abundance of amazing wildlife living in that one park. But I couldn’t figure out why Kathy wasn’t more excited. Finally, one day, she told me that she had pictured in her mind the Boy Scout-type pup tents we had seen lined up a few feet apart, on the road outside the entrance! She was trying to figure out what we’d do for sleeping bags and how to dress for such a primitive outing. But when I showed her a photo of the luxury tents we’d be staying in, she almost fell over! And when we got there, we were both instantly entranced and ready to stay forever! The fantastic sleeping tent was sumptuously decorated with four-poster beds and beautiful white canopies… the meals were one delicious surprise after another, luxuriating in comfy chairs and white tablecloths… and the staff were amazing! Each room in these camps typically comes with a room steward (or butler as they’re sometimes called) who makes your bed, leaves you a little gift or note, places a warm water bottle at your feet on cold nights and takes your laundry. He or she often slips coffee and breakfast rolls inside your tent each early morning as a wake-up call before your early-morning game drive! They heated and carried hot water for our showers… and they brought us delicious drinks from the bar. Trust me: there is absolutely NOTHING like sleeping safely in a game park, where you can see and hear the animals outside, from the moment you wake up in the morning and peek out at sunrise, until you drift off asleep to the sound of their snorts and calls in the dark of night! It’s magical! And that’s what awaits you when you come to Kenya with us! No pup tents… we promise! Just a luxurious, bountiful, adventure… like nothing you’ve ever imagined. Come join us! All in the company of world-class guides, like-minded photographers, and professional filmmakers, photographers, and instructors Joe and Kathy Sindorf—traveling with you to teach you the skills and techniques you need to shoot pictures that sell for $50, $150, $500, or more. If you long for adventure… a new career… or a side hustle that helps you travel whenever you like… live wherever you choose… and make an income doing something you love, this trip is for you! This trip will be extra special because we scheduled it around the new phase of the moon! This means that almost every night of this expedition, we will have a very dark sky, against which the stars, planets and constellations will glitter and shine like diamonds on black velvet. I love shooting the night sky and I’ve developed an easy workflow that anyone can use to get great shots of the Milky Way on their first night. This is a screen shot of what the sky will look like in Samburu at 10 p.m. on March 6, 2019 when we are at the complete stage of the new moon. As you can see, the Milky Way is huge and right on the horizon in the southern sky! Perfect! Throughout this trip, in both Samburu and the Masai Mara, when we have a sky that isn’t cloudy, I’ll be out shooting Milky Way images and will be teaching anyone who wants to learn how to do it… and do it well! So bring a lightweight tripod, and prepare to amaze your friends with your shots (they will be asking to use your photos as screen savers, and you’ll be on your way to selling your images as stock photos and fine art!). This is a truly great time to go to Kenya! Fewer crowds: This is not the high season when safari vehicles have traffic jams around trees where a leopard has been spotted, or when every room is booked and the camp staff is worn to a frazzle. Instead, we’re a bit picky… we like our safaris with a bit of elbow-room! If we don’t see another safari vehicle all day, we’re happy campers! If we’re there all alone and can direct the driver to the exact place we want the jeep, so the light is gleaming in the lion’s eye, we’re ecstatic. The month of March is ideal for this. More economical: Off-season means lower rates… and that’s a good thing! On this trip it means we can fly between locations instead of driving on killer, bumpy roads. It also means we can stay at really, really nice camps instead of just nice ones. End of the dry season: As the dry season progresses, the waterholes and steams start drying up, and animals move to known sources of water. This makes it much easier to locate them. Instead of trying to spot game over large portions of land with high grasses where the wildlife can easily hide, we can go to the few areas with water and the animals will come to us! A great time to get away: You’ll have made it through the winter months and be ready for some sunshine, fun, and beauty in your life. You’ll schedule your flight to arrive on this day (or the day before) and transfer to our hotel. The drive to our hotel is about 20-30 minutes. You’re now in Africa and this first short trip could yield some wildlife. One evening two years ago, Kathy and I did this exact same drive and saw five beautiful zebras standing by the road as we exited the airport—so keep your eyes open. You’ll enjoy this property. The Ole Sereni served as the Embassy of the United States while the new embassy was being built, so it is secure, safe, and immaculately decorated. Plus, it’s right on the perimeter of the Nairobi National Park, the only wildlife refuge in the world that is located within the borders of a nation’s capital city. I’ve enjoyed dinner on the outdoor deck of this hotel and watched giraffe and zebra pass by… not bad for your first night’s meal! Most international flights arrive into NBO in the evening. If you plan to arrive a day early, you can arrange a day tour of Nairobi with the hotel, or simply relax and acclimate. Your hotel on that extra night will be at your own expense (approximately $290 single occupancy, $253 for doubles). There is a fence on the Nairobi side to try to keep animals from wandering into the city, but there is no fence on the other sides! You’ll explore wide-open grass plains with a curious, yet beautiful, backdrop of the city high-rise buildings. This park is home to a wide variety of amazing wildlife—I’ve seen the endangered black rhino, lots of lion, Cape buffalo, giraffe, and so much more. It really is a lot of fun! Also highly recommended is The David Sheldrick Elephant Orphanage in Nairobi. With donations the orphanage receives from tourists and local businesses, they’re able to save (by helicopter) and later rehabilitate baby elephants who fall into wells… get caught in the nasty current of the Mara river when they try to cross… and/or who are left alone after their mothers are killed by poachers. Adopting an elephant (usually around $50 unless you’re prepared to spend more) gets you in after tourist hours to visit and photograph your elephant too with fewer crowds. I highly recommend it. After breakfast on us at the hotel, we’ll introduce you to your new friends and then load up everything to transfer to the Wilson Airport for the short flight to Samburu. Let’s be honest… I truly love Kenya, but I really hate spending hours in a rugged Land Cruiser bouncing over rough, dusty roads in the heat of the day for hours at a time… so on this expedition, we’ve saved you from that! This short 90-minute flight will free us from six hours of bouncing down the road. You’re welcome! Upon arrival, we’ll immediately embark on a game drive as we travel to our base camp for the Samburu region—the Elephant Bedroom Camp. After a much-deserved welcome drink, we’ll check into our rooms and then meet for our first photography presentation—giving you the basics you’ll need to get started, and you’ll learn the specific camera setting secrets that we have been successfully using for years to get sharp, excellent, saleable photographs of African wildlife. Your home in Samburu will be the lovely Elephant Bedroom camp, situated on the banks of the Ewaso N’giro River, deep within the Samburu National Reserve. The property has a fabulous riverside location, surrounded by immense doum palms and acacias that provide much-appreciated shade from the equatorial sun. The lounge, dining area, and bar occupy two large tents, raised above ground level to ensure spectacular views of the river and the savanna, stretching to the horizon. The lounge contains ample comfortable seating, vibrant rugs, and art created by local craftsmen. Their work is also on display in the camp’s dining tent and for sale in the camp’s small shop, which sells an assortment of curios. But perhaps the main attraction at the Elephant Bedroom Camp is the elephants! These gentle giants are routinely spotted nearby and often they wander all the way into the camp reminding you that you are, in fact, staying in an elephant’s bedroom. The guest accommodations are linked to the main areas of camp via stone-lined pathways. Each tent boasts a veranda with a table and chairs where you can sit and watch the elephants pass by—and a private plunge pool where you can relax after a warm day. Inside, the décor is comfy and stylish. All tents have en-suite bathrooms that include a proper flush toilet, twin sinks, and a hot shower. It’s luxury in the wilds of Africa! After an early-morning game drive, we’ll head back to camp for lunch and a photo review to ensure your camera settings are on the right track and you’re capturing the kinds of images you want. “We make sure that we set aside time for photo reviews on this expedition because it’s an important part of this trip and a unique opportunity to learn from published, professional photographers. Another unique thing about GEP photography expeditions is our focus on getting beautiful and creative images that you can sell when you return home. So you’ll see that we not only photograph animals on this tour but also add landscapes, close-up macro images, and opportunities to capture the stunning African sunsets and people. We’ll take you step by step through the right camera settings and show you how you can use your camera to turn an average vacation snapshot into a photo worthy of wall space and a magazine cover. Then, we’ll head out on our afternoon game drive, building on the skills we’ve learned and getting shots that just days ago you wouldn’t have dreamed possible. On our way back to camp, we have the great privilege to be invited to visit a Samburu village. Because of their remote location, the Samburu have retained much of their culture and distinctiveness. At first glance, you may think they look like Masai people—and they do share many common traits—but they are unique in many ways. When Lori was there this past May, she arranged for us to have a private photo shoot with this tribe during the best light hours of the day. They’ve also agreed to sign a model release, so you will be able to sell your images as stock photography or editorial if you choose. Upon return to camp, we will delight in a wonderfully delicious dinner, and toast the incredible day as we think back on the wonders of Africa. This will be another day with two spectacular game drives—one in the morning and one in the late afternoon. The decisions on the locations we’ll visit and the wildlife we’ll be photographing will be up to the minute, based on reports that we receive from park rangers and other safari vehicles that are traversing the Samburu. We’ll be exploring using three specially equipped safari vehicles. Many companies put a paying customer in every seat in order to maximize their profit, but if we were paying for a once-in-a-lifetime safari, we wouldn’t want to be crowded in the middle of a row of seats, unable to get to the window to get a clear shot of the spectacular wildlife and landscape… and we don’t think you should have to put up with that either! Everyone on our GEP safari expeditions is sitting by a window. You’ll have space near you for your camera bag. You can stand and photograph easily and comfortably without needing to worry about blocking someone’s shot. This is how every photographic safari should be run… but it is truly rare and another great reason to travel with Great Escape Publishing. In the late afternoon, we’ll do a second game drive to capture the animals in another light, when they are active as the temperature starts to drop and as the sun dips to the horizon. If conditions permit, we’ll get tremendous sunset shots and you’ll learn how to make starburst and sun flare effects in your… we may even enjoy a sundowner cocktail together in the magical golden hour of an African sunset! Today, March 6, is the New Moon… when the sky is its darkest. If the weather cooperates, we’ll be leading a night-sky photography session, to help you successfully take stunning photographs of the Milky Way! After breakfast, we’ll check out of our wonderful tents and head to the airstrip, about an hour’s drive. Along the way, we’ll be looking for any last-minute sightings of wish-list wildlife. We’ll board a Cessna Caravan safari plane for our 90-minute flight, which cuts out an excruciating 12-hour drive. We’ll land at one of the premier game reserves in the world—the Masai Mara. A 15-minute drive later and we’re at our basecamp, the Little Governors’ Camp. After we check in, settle into our tents, and freshen up a bit, we’ll bring everyone together for an editing class where you’ll learn the simple, proven workflow that we use on 90% of our landscape and wildlife photographs. Plus, you’ll learn how to take the night sky shots from last night and make them come alive! The Little Governors’ Camp is a small, exclusive safari camp located inside the Masai Mara National Reserve—which means we won’t have to waste time getting to the action! This is a wonderfully intimate camp with just 17 luxury en-suite tents, each with large verandas, tucked around a watering hole teeming with birds and wildlife. You’ll love the resident family of warthogs that wander freely through the camp, and you may need to make way for elephants that sometimes visit us! Little Governors’ Camp uses electricity that has been generated by the abundant solar power and it’s been awarded a Gold Eco-Rating from Eco Tourism Kenya for their sustainable practices. Hot water is provided by a wood-burner, and power sockets provide solar-generated electricity throughout the day and night. This is a perfect location for our exploration of the Masai Mara! Here in the Mara we will have two game drives each day, much like we did in Samburu. Animals are more active in the cooler parts of the day, so we plan to be out in our safari vehicles at sunrise and a few hours afterward, and then again late in the afternoon until just after sunset, when your photos will have the best natural light. Our schedule is geared to help you get the best photos possible. By this point in the trip, you’ll be in the groove—wishing you could continue doing daily safaris and being treated like royalty for the rest of your life! At the equator (during this entire expedition we’ll be within one degree of latitude from the equator) the days and nights are roughly equal in duration, with the sun rising at about 6:30 every morning and setting at about 6:30 every evening. So that will give us a few hours in the middle of each day for working on our photos, having classes, or just relaxing. There are two game drives today in the Masai Mara—again in the morning and late afternoon as we continue pursuing the images we’ll hang on our walls and sell to publications for use around the world. As you’ll instantly notice, the landscape is different here than in Samburu — it is vast and awe-inspiring! Little Governors’ Camp is located in the heart of what is widely considered to be the best game viewing area of the Masai Mara. The safari vehicles we’ll use are custom-built 4-wheel-drive Land Rovers. The drivers and guides are hand-picked for their unmatched knowledge of the Masai Mara and the movements and habits of the wildlife. In each of the three vehicles, there will be an instructor to help you get the very best photos possible. And you’ll have a chance to ride with each of the three professional instructors over the course of the trip. The learning doesn’t just happen in class, it also takes place in the Jeeps with hands-on instruction by trainers who want to ensure your success. Early this morning we’ll head out on our game drive, looking for lions on the hunt, or a leopard sleeping on a tree branch, its belly full. Every trip is different, and you never know what you’ll see, but our excellent guides are skilled at spotting the wildlife along our path. You may see lions or zebras mating… elephants hanging out along a waterhole or a cheetah sprinting after its prey. The surprises are new and always amazing! Along the way, you’ll see exotic birds, hyenas, zebras, giraffes, gazelles, impalas… and so much more. Today we’ll have our final photo review, and marvel at the amazing growth we’ve made as we’ve learned new skills, put them into practice, and grown as photographers. After our final game drive, we’ll enjoy sundowner drinks and snacks as golden hour turns to blue hour and then to night. Finally, we’ll celebrate our incredible safari with a memorable farewell dinner and toast the new friends we’ve made and all we’ve shared together. You’ll undoubtedly have found some amazing, like-minded people who you’ll want to visit after the trip and maybe travel with again. After breakfast, we’ll move out of our tents and say a sad farewell to the wonderful people who have taken such great care of us. After a short drive to the airstrip, we’ll fly to Nairobi’s Wilson airport. This is where our expedition comes to a close, but you can choose how and when your time in Kenya wraps up. Most people will choose to schedule a flight home today (please only schedule flights that depart after 4 pm), while others will stay overnight and catch a flight out tomorrow. If you decide to stay over and need a hotel room, day rooms are $100 for the day. Overnight rooms are $290 for single occupancy and $253 for doubles. If you’d like to extend your stay and see more of Kenya or East Africa, we can put you directly in touch with our guides for trip planning, pricing, and special requests. You MUST book these options at least three months in advance. Note: Our workshop schedules and instructors are always subject to change due to weather and other unpredictable events. The primary focus of this workshop is on photography and areas that are good for travel photographs. There is something about Africa and its endearing people that becomes a part of you. Kenyans love visitors, and they are some of the most fun-loving and sociable people on the African continent. The first time I (Joe) traveled to Africa was way back in 1984. I was on assignment and visited six countries on that trip… it forever changed my life… and Kenya has remained one of my favorite places on earth! Ernest Hemingway said, “I never knew of a morning in Africa when I woke up that I was not happy.” And I can tell you that I cannot remember a time when I left the continent and didn’t want to return. After this expedition, not only will you come away with a real passion for this part of the world—having discovered it off the beaten tourist path with travelers and professional photographers who have lived here and called it “home” — but you’ll also learn all the tips and tricks you need to take amazing photos… and sell them… a skill you’ll keep for life! Whether you have little experience and modest equipment or you’re already a talented photographer, you’ll benefit from daily, one-on-one interaction with professional photographers who truly want to see you grow and excel in your skill and confidence. You don’t need a $1,000+ camera and tons of equipment to have fun and create images you can sell and be proud of—you can even use your phone or a “point-and-shoot” camera, if you prefer—and this March, we’ll show you exactly how it’s done. Come on! Follow your heart and join us in Kenya for the trip of a lifetime! We are Joe and Kathy Sindorf and we have lived in Kenya and just loved it. Additionally, we have lived in the Philippines and have worked in numerous countries around the world. Africa has captivated our imagination and we have traveled extensively throughout the continent, cameras in hand, and explored the well-known tourist destinations as well as the remote, out-of-the-way locations that don’t show up in travel guides. We try to embody the ideals of being travelers and world citizens, not tourists. Joe is an award-winning filmmaker and photographer, who’s been published internationally and has worked in more than 75 nations. Kathy is an award-winning television producer and university professor who teaches video, photography, and digital media skills in the classroom and on location. Together, we’ve trained humanitarians in seven countries how to shoot video and tell visual stories that impact their audiences emotionally. We discovered long ago that our talents merge perfectly and our passions combine seamlessly… we love helping people grow in their skills. Joe has led several photographic expeditions for Great Escape Publishing and together we’ve led multiple academic study programs to Jordan where students have learned photography, video, and writing skills, while working with refugees from Syria and Iraq. We also co-led a tremendous GEP Photo Expedition to Tanzania in 2017. We know and love Kenya, and wildlife safaris, and we are so excited to introduce you to this place that has been our home! I am thrilled that you are considering joining the GEP Kenya Photographic Expedition. This truly will be a trip of a lifetime. I thought you should know why I hand-picked Joe and Kathy to lead this expedition. Motivational speaker Jim Rohnfamously said that ‘we are the average of the five people we spend the most time with.’ If that’s true, I want to spend much more time with Joe Sindorf because he will definitely “up” my average! Joe is a talented photographer and a phenomenal teacher and trainer– not to mention an incredibly approachable person. He’s an amazing man, and he is so humble. He has won several prestigious awards, but I didn’t even know that about him until after I had asked him to lead a photo expedition for Great Escape in Tanzania. He doesn’t brag about these kinds of things. He’s not the kind of guy who has a trophy case full of awards that he dangles about in every conversation. He’s just a normal, down to earth, nice guy who does good things for the right reasons. I’m glad to call him my friend. And then I met his wife, Kathy, and I just adore her—and so will you! I asked Joe and Kathy to lead this expedition to Kenya because they have lived and worked there and they know it well. They have traveled to all parts of the country, they understand the culture and the traditions, and they have many friends there… and they just can’t wait to share it all with you! Joe and Kathy are the perfect hosts and instructors to introduce you to the Kenya that was their home and the country that they truly love. This event is sold out. If you’d like to check in and see if we get any last-minute cancels and a seat opens up, please email Kacyn here. Here at Great Escape Publishing, we’re committed to creating tours and experiences that are unlike anything you will find elsewhere. Here is our 4-POINT PROMISE about what you can expect on this expedition and what makes us different. From Hacienda-style lodges in Ecuador… to luxury tent camps in the Masai Mara in Kenya… casas particulares in Cuba… or a luxury boat in Ha Long Bay… our choice of lodging might just be your favorite part of the trip! We like to explore something the average tourist might not know about. We’ve made connections on the ground so we can visit the best sites, markets, festivals, restaurants, cafés, and villages that would be hard to find on your own. We’ll use local guides where possible instead of well-advertised companies and we’ve geared our schedule toward photographers, so you can skip right to the heart of Kenya and capture something the regular tourist never will. Photography tours are a dime a dozen. But try to find a tour that teaches you how to shoot compelling photos AND how you can sell those images for a nice side income… and you’d be hard pressed. The truth is, a lot of people today aren’t crazy about sharing their photography secrets and their income-earning advice with newbies. But the photographers who lead Great Escape Publishing trips are some of the most generous teachers out there. They know that the need for great photos and great articles is only increasing—so the more people who can fill this need, the better for everyone! On this expedition, you’ll have experts by your side every step of the way, ready to share their professional insights and secrets to help you travel the world and get paid to do so. Kenya is a premier safari destination in Africa that offers all levels of camps and lodges. But as part of our commitment to quality and to authentic experiences, we’ve selected small, luxury tented camps—that means we are located in the best places for seeing the choicest wildlife, that you won’t have to deal with crowds, and you’ll have a more intimate experience overall. This level of luxury comes at a price. However, if you agree to share your room on this trip with another attendee, we can save you a small fortune on your fee. Exclusive safaris like this are among some of the most expensive expeditions in the world, so the best way to cut costs is to double-up. There are no other photo tours of this caliber being offered today. The only way we’ve been able to package it is because we have friends on the ground who’ve told us about opportunities travel agents don’t know about and we scouted them ahead of time to find the best vantage points for photography and experience. Most people visit Kenya in July and August, which are great months but the parks are crowded with vehicles and the costs are sky high. Early March is great because it is just before the rainy season begins, the wildlife is accessible, and we’ll essentially have the parks to ourselves. Other tours will take you on a main tourist route where you may, or may not, get good photos. This expedition, however, is exclusively designed with photography in mind. We will ensure that you are in position to get the best wildlife shots possible. Other similar tours will charge at upwards of $11,000. They’ll add on days and have you in the Jeep way more often then you’re out of it. You’ll get tourist-grade accommodations and honestly, you’ll just be so happy to see your bed you probably won’t even care. But not on this trip! We eliminated almost all of the hot, dusty, bumpy, mind-numbing driving and we won’t waste your time in un-photogenic areas or set-up-for-tourists spots. We shaved $1,350 off the cost of this expedition, and you’ll save even more if you agree to double up and share a room with another like-minded participant (and make a new friend at the same time!). … and take an additional $600 off when you’re one of the first to register today. What’s more, if you’d like to take advantage of our easy payment plan, you can register today for just $1,700 down. Reserve a seat on the expedition for just $1,700 when you put your name on our attendee list today. We’ll bill your credit card $1,700 today, and 6 equal monthly payments thereafter. So you spread out the payments comfortably over 7 months between now and when the workshop starts in March. Pre-event guidance from Great Escape Publishing staff including what to expect, what to pack for the weather, equipment list, travel tips, and more. Your visa fees into Kenya (this is something you can pay for online after you’ve booked your flight). At last look it was $51. The only way we can ensure affordable tours without sacrificing these experiences is to offer them one at a time, which means we don’t publish a yearly expedition schedule on our website. Please note: If you’re someone who needs more advanced notice for budgeting and planning purposes, we have plenty of trips that are announced 9-12 months in advance. But other trips require quicker planning and execution, so please understand that sometimes we announce trips with just 3-6 months’ advance notice. A light raincoat or poncho… just in case! Please inform your doctor that you are going to the Samburu and Masai Mara areas of Kenya—you may be advised to take anti-malaria medication. Typhoid is also recommended for Kenya and it now comes in pill form. You can get it from a local travel clinic at least 30 days before your departure. If you’re a U.S. citizen, you need a current passport that’s valid at least SIX months beyond your planned date of departure, a Kenyan visa (now available online) and at least two empty pages in your passport. If you are a U.S. citizen, you can easily get your Kenyan visa online. The link is: http://evisa.go.ke/evisa.html. You don’t even need to send in your passport. We highly recommend insurance coverage for cancellation. We also recommend supplemental travel insurance to protect yourself in case of unplanned medical emergencies. We’ll send you more details about insurance and whether or not you need it after you register. The currency in Kenya is the Kenyan Shilling (KES), which is about 100 KES to 1 U.S. Dollar. You can get Kenyan funds out of an ATM when you arrive in Nairobi. They also accept U.S. dollars. Check with your bank before you leave to make sure your card will work in Kenya. Have them add a note to your account that says you’ll be making withdrawals in Kenya (some banks will freeze your funds if they suspect someone has stolen your card and is trying to use it overseas). Kenya uses the British 3-prong “Type G” plug, and, at times you’ll find the European-style two-prong “Type C” plug. Almost all laptops and camera battery chargers have an electricity converter built in to the power cord or to the unit itself (that means you probably won’t need a converter). For these things, you simply need an ADAPTER plug, which you can usually find at Target, Best Buy, Radio Shack, Circuit City or Amazon. None! All skill and experience levels are welcome, and the concepts introduced are doable by anyone. Point-and-shoot cameras are welcome. It doesn’t matter what level of photographer you consider yourself to be, or if you’ve never tried selling your photos as stock or elsewhere. This workshop is a once-in-a-lifetime opportunity for folks who truly want to get paid to travel. Not only will it include exploring the beautiful and fascinating country of Kenya, but you’ll have the opportunity to sit down with in-demand, professional photographers to go over the photos you’re taking and learn how to improve. You’ll get in-the-field guidance and loads of help with your camera settings, too. You’ll learn a LOT in 8 days, and go home with some amazing shots. Again, there are only 12 seats available. We urge you to sign up today, so you don’t get disappointed. Most of this workshop will be spent out-and-about in customized safari vehicles designed to accommodate photographers. Game drives during the day can be long, often traveling for several hours and bouncing around on the very bumpy, un-paved roads. While this may not be considered strenuous activity, it can be uncomfortable and physically demanding on the body. On this expedition, you must be able to climb in and out of the raised safari vehicles and be able to stand on your seat in the Jeep in order to shoot photos with your camera resting on the vehicle roof. Please understand that if you are unable to get up and down on your seat, you may be limited to only shooting out the side window. A fine option but please understand your own physical limits. You should also be able to walk around our camp accommodations, sometimes over uneven or rocky terrain. There are often uneven steps, and ramps are virtually non-existent. Rooms are spread throughout the property. This means you may have a several-minute walk to your room (with a guide) from the main area, so please be prepared for that or let us know ahead of time if you have physical limitations that would prevent that. There are also several small flights on this trip with weight limitations per passenger. If you think you might exceed this weight limit, or may have trouble boarding these very small airplanes, please call our office before registering so we can look those numbers and dimensions up for you. If you are unable to keep up with the group for any reason, you must understand that you may have to forfeit your ability to participate in an activity. If you have concerns about physical limitations, please contact a Great Escape Publishing staff member before registering. You can email us at workshops@greatescapepublishing.com or call (561) 860-8266. This workshop is a once-in-a-lifetime opportunity for those who truly want to get paid to travel. Not only will it include loads of exploring the fascinating country of Kenya, but you’ll have the opportunity to sit down with Joe and Kathy to go over the photos you’re taking and learn how to improve. You’ll get in-the-field guidance and loads of help with your camera settings, too. You’ll learn a LOT in 9 days and go home with some amazing shots. Again, space is limited to 12 attendees only. I strongly urge you to sign up today. So please, register here now by clicking below or if you have any questions call our office today at (561) 860-8266 (Eastern time zone). You can also email Lori Allen at lori@greatescapepublishing.com. “I learned a lot… I met interesting people and I became excited about trying to make money from photography… an excellent value and provides information that is difficult to acquire in other ways.” — Susan H.
“I learned more in three days than I have all year. Between Thursday’s photos shot and Saturday’s photo shots – it is like night and day.” — Lynda I. We strongly suggest you protect your investment by purchasing trip-cancellation insurance. We recommend using sites like Insuremytrip.com to compare rates or purchasing through your airline when you buy your plane ticket. We will send you details about trip insurance in an email following your registration. It’s not right for everyone so we’ve done some research on your behalf. The Kenya Photography Expedition is non-refundable. If there is an emergency or a medical reason you need to cancel—and we can fill your seat with another paying participant before the event—we can offer you a workshop credit good toward another event in the amount of what you paid minus a $500 credit card processing fee. Refunds to your credit card are not possible.